One of the most important model railroad scenery tips that I could pass along is to try to pay attention to details. If you ever get a chance to see any pictures of George Sellios’ Franklin and South Manchester layout, you will be inspired by the preponderance of detail and what an extensive but realistic statement about the complexity and simplicity in our lives all at the same time. 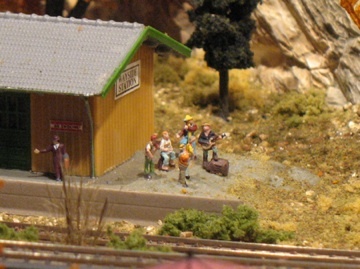 The details of model railroad scenery are what make the scenes and your entire railroad come alive. So many times, we skip the details because they are a little time consuming and we always think we can add them later but we never do. Sometimes, I think we try to over-extend ourselves and create these large sprawling layouts that aren’t very detailed, because there’s no time to devote to these seemingly minor things. If you have a smaller layout, there may be more time to spend on the details. Of course this is mostly personal preference. I have personally done both and I liked the smaller one better. In city scenes especially, you have only to look, for a discriminating moment, at your own downtown area to see all the mailboxes, lampposts, telephone booths, cracks in the sidewalk, weeds coming out of the cracks, potholes in the streets, telephone poles, overhead wires, automobiles, clutter, litter, etc., etc. You also have people walking, loitering, talking, working - doing all the things they do everyday. In rural and suburban scenes, you have weeds growing in all kinds of places, underbrush in and around the trees, leaves that have fallen, mud and potholes in dirt roads, people on tractors, working on farms, riding horseback, fishing, kids playing baseball in an abandoned lot, homeowners working in their yards, neighbors talking, electrical towers and lines; the list goes on and on. At trackside, you have switch stands, targets, line poles, mileposts, speed signs, instrument cases, and hoses, flanger signs, whistle posts, bumping posts, car stops, , bridge rails and walkways, bridge guardrails, fences, weeds, clutter, old rail ties, railroad work crews, etc. Everyone has telephone poles on their layouts, but how many of us have taken the time to put wires on those poles? This adds a huge amount of realism to any model railroad scenery project. The best wires to use are called EZ Line and can be found at http://www.berkshirejunction.com/. Of course, you don’t have to add every one of these model railroad accessories to your layout, but the more of them you have, the more interesting the scenes become and the more you will enthrall yourself and your viewers. From "Model Railroad Scenery Details" to "Model Train Scenery"
From "Model Railroad Scenery Details" to "Homepage"